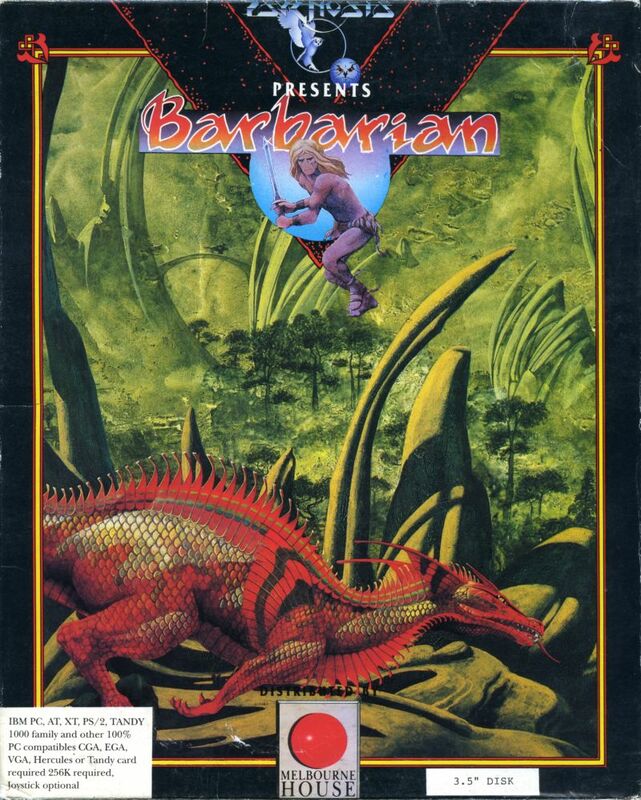 [2019 with DOS games] The Bard’s Tale / Barbarian / Betrayal at Krondor – I ❤ Old Games! This is the second entry of the [2019 with DOS games] column, a mini-compendium of the mandatory MS-DOS games ever released. For a big part of my life I’ve been a PC games player and I had tons of old games to play with back in the 90s. This is my homage to them. The rules are simple. MS-DOS has been created in 1981 and was still available in computer until the early Noughties. However the release of Windows 95 acted as a break and everything before immediately becaome. So I can fairly tell that the DOS era goes from 1981 until 1985. [2019 with DOS games] will feature every two weeks a selection of three games, one for every five-year period (1981-1985, 1986-1990 and 1991-1995) in alphabetilac order that I consider either important, ground-breaking or simply fun and easy to play. I’ll try to consider only DOS-exclusive games or in case games spread on different platforms that have the PC version as a flagship. No claim of completeness, I’m not a human encyclopedia (unfortunately…). Let’s go with letter B. The Bard’s Tale is one of those games that seems to come from the future. The visuals were absolutely magnificient for a 1985 game and has the charm that only Dungeons and Dragon games have. This is just the first chapter of a trilogy released the same year and is a linear dungeon crawler set in a world of 900 scenes (a map of 30×30). It was a critical success and is one of the first games featured in the Hall of Fame of the magazine Computer Gaming World. 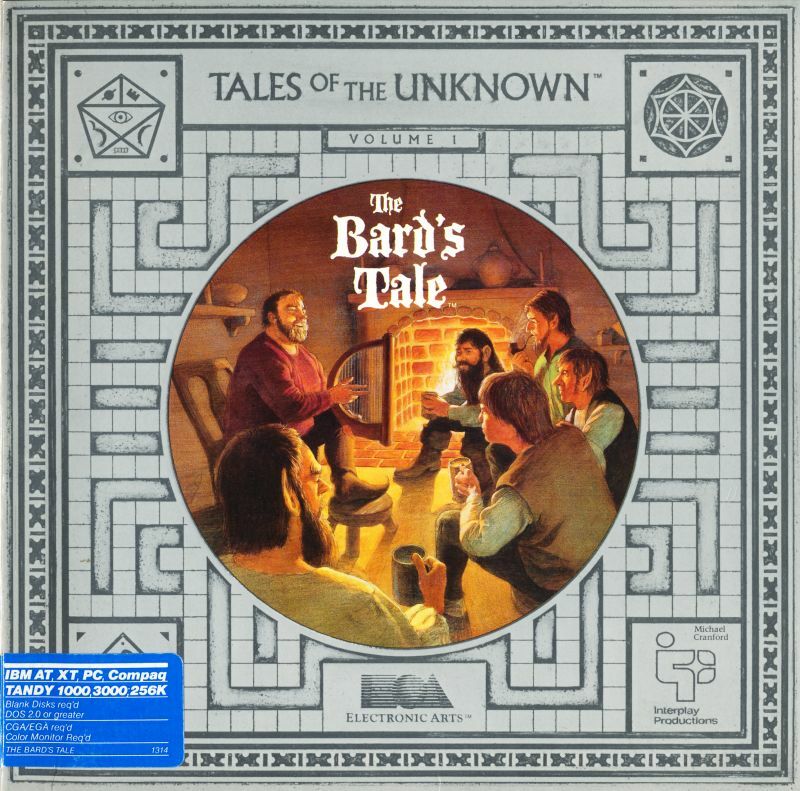 In a poll they made in 1990 The Bard’s Tale resulted 7th among the favourites games of all time. This is not the same Barbarian (a.k.a. Death Sword) of 1987, fighting game with a great box cover featuring a fresh then-18 years old Maria Whittaker (Mother Nature has been generous with her), but it’s a fun action platformer landed on MS-DOS after its original Amiga release. It received good reviews (around 80%) and the name behind it, Melbourne House, is a warranty of a good product. I’ve played originally on my uncle’s ZX Spectrum and I’ve tried the DOS version only in recent years, when it became available for DOSBox. The RPG world is full of a moltitude of games, with tons of sub-categories so we can easily say that there’s an RPG for every gamer taste. I’m not that much into RPGs and the one I loved the most are the ones à la Diablo II or Baldur’s Gate 2: visually polished, isometric and with a lot of marvellous descriptions of items and spells to read, like they were DnD Player’s Handbook (one of the most beautiful books ever released in any time on every possible subject). 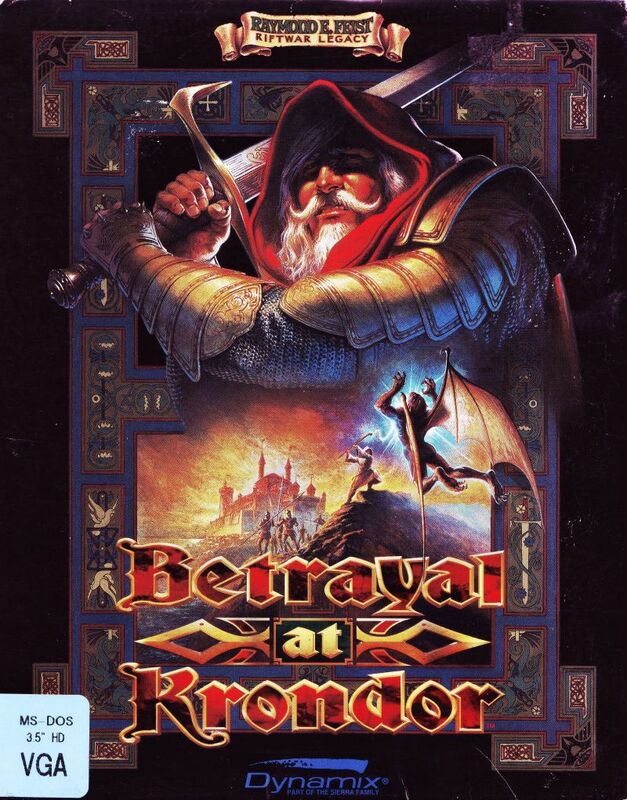 Betrayal of Krondor has some of the elements of the RPGs I love, since it’s surely visually inmpressive, with the images of the protagonists that look like real pictures, a great and detailed inventory (I could stare at it for days…) and can be either played as a top-down 2D or first person 3D. Plus all the adventure is designed to look as a book with different chapter and bookmarks, something that’s really neat. Betrayal of Krondor has been a double face game: originally it wasn’t quite successful and the sales of the 3,5″ floppy format were slow, but when it came out again on CD-ROM the sales boomed and so did the reviews, usually over 90%. 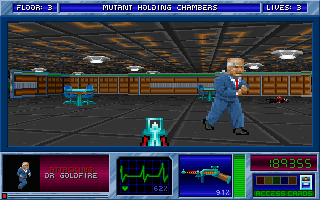 Computer Games Sytrategy Plus named it best overall game in 1993. Of course only three games out of the hundreds released in 15 years is a terrible simplification. I’ve decided not to put in the selected three games some titles that, in my opinion, deserved to be on top, but just because I’ve already revisited them in the past and I’ve excluded also some games that I consider good but came out on several platforms before landing on DOS (like Bill & Ted’s Excellent Adventure). Let’s talk about some of the honorable mentions. In chronological order the first is Beyont Castle Wolfenstein, the sequel of the game that first indtroduced a sketched stealth mode. Another huge favourite of mine is Balance of Power. 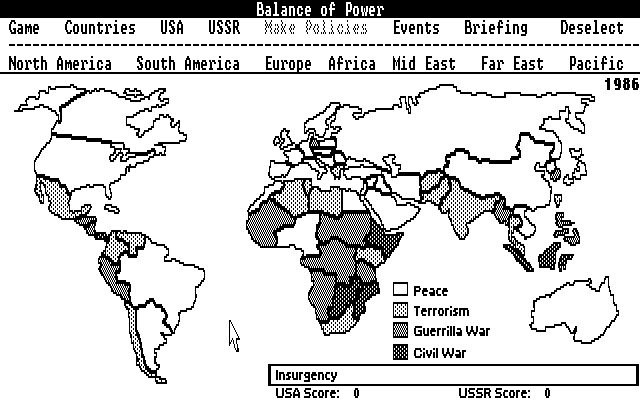 It’s a game I loved and still love, a political simulation that today brings tons of nostalgia, a strange nostalgia of a period that was everything but calm but is still so appealing. It looks like an easy game but you’ll have to sweat a bit to “win”. Another great favourite of mine is Blake Stone: Aliens of Gold. When I was a kid at first I didn’t own the original Doom and I got Duke Nukem 3D several years later and this game was the closest to Doom I could play…and it was really good back then! I used to play also a lot of flight simulators and B-17 was one of them (being the other Falcon 3.0 and EF2000) but if I have to talk about game I REALLY played endlessly I have to cite Big Red Racing, B.C. Racers and Beneath a Steel Sky. While Big Red Racing and B.C. Racers are those kind of games that can be picked up and play since they’re easy to un derstand with and they’re always fun (especially if you have the sound turned on…), Beneath a Steel Sky is a great graphic adventure that unfortunately I still haven’t completed and is one of the few non-LucasArts point-and-click I really enjoyed (being one of the others Lure of the Temptress). 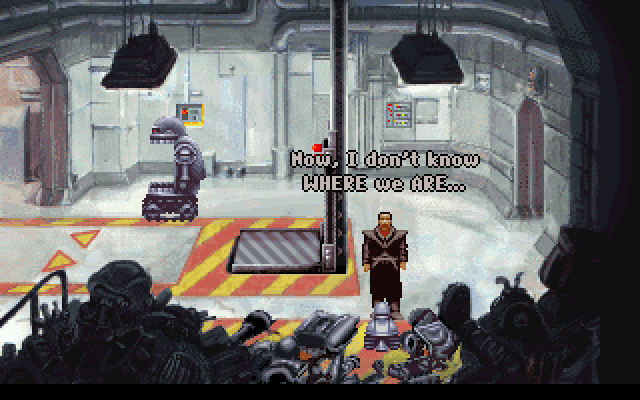 The game is set in a dystopian and cyberpunk future that bears some resemblance to the immortal masterpiece Metropolis by Fritz Lang and probably this is the reason why in the late Noughties I started to appreciate it even more, since I had started to explore Fritz Lang filmography. So there was a lot to cover this week, stay tuned and in two weeks you’ll discover what letter C has to bring! I remember playing Big Red Adventure and not being able to finish it because the puzzles were so confusing. Standard point & click moon logic! You can die in those ones can’t you! That’d be infuriating. I have heard good things about The Bard’s Tale. What you have to say kind of makes me want to check it out to see if it holds up. Considering that is more than 30 years old I can say it holds up very well! Pingback: [2019 with DOS games] Castle Wolfenstein / Cadaver / The Chaos Engine – I ❤ Old Games!